A record crowd attended the National Agriculture Spring Luncheon held today at the Agricultural History Project located at the Santa Cruz County Fairgrounds in Watsonville. A record crowd attended the National Agriculture Spring Luncheon held today at the Agricultural History Project located at the Santa Cruz County Fairgrounds in Watsonville. At the event, the 2014 Al Smith Friend of Agriculture award was presented to Patrice Edwards, Publisher of Times Publishing Group, Inc. The annual event is coordinated by the Santa Cruz County Farm Bureau and the educational organization Agri-Culture. This year’s presenter was H.A. Rider and Sons owner Tom Rider who was the 2013 award recipient. Also presented at the luncheon were the winner of the 2014 National Ag Day Poster and Poetry Contests. For the first time ever, a brother and sister won both contests. Joel Burchell, won the poster contest. His sister Autumn Burchell, who won the Poetry Contest, read her poem at the event. 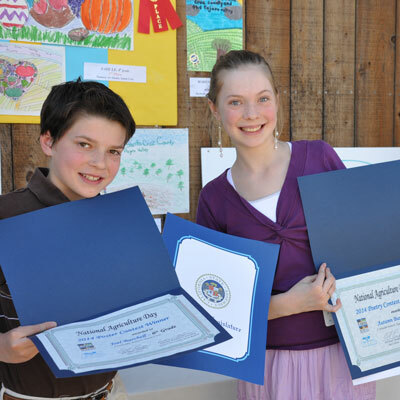 Both siblings attend Creekside School in Santa Cruz. Attached is a list of all winners. It was announced at the luncheon John Paul (JP) Thompson was selected as the 2014 recipient of the Jimmie Cox Memorial Scholarship. Attached is information about JP. Other notables in attendance include Congressman Sam Farr; County Supervisors Zach Friend and Bruce McPherson; California Certified Organic Farmers Executive Director Cathy Calfo; Bill Codiga; Founder and CEO of South Swell Ventures, Bud Colligan; City of Santa Cruz Mayor Lynn Robinson; Scotts Valley Councilmember Stephany Aguilar; and Cabrillo College President Laurel Jones. Click here to check out more photos from the National Agriculture Day Spring Luncheon.